This past year I have become a CrossFit Level 1 Trainer and I have integrated much of what I have learned into my training sessions with clients and my own personal exercise routine. Metabolic Conditioning (Met-Con) is a revolutionizing fitness movement that has been popularized partly by CrossFit in the last 10-15 years. It has also been around and used by others for much longer. Metabolic conditioning stresses the importance of high intensity interval training, heavy weight lifting, and compound movements to shape a challenging and effective workout regimen. Through this program trainers are able to provide a fast paced, constantly changing routine to keep participants interested, stimulated, and motivated. Unfortunately there is a stigma around this kind of training as being dangerous and having a higher potential for injury due to the variety and high intensity within the programming. Although this may be the initial impression, I believe it is actually the opposite. If applied appropriately, each program can be tailored to an individual’s abilities and adapted to their level of fitness. The key is modifying the intensity of the workout by changing the load, volume, and even the movements themselves. By diversifying workouts and helping a person become proficient across a variety of movements, it can help to improve their movement and functional capacity. Because of this it may result in a safer and overall better workout. In metabolic conditioning, athletes and general exercisers train in a way to perform as well as possible in all areas of fitness. This is opposed to being an expert in just one or two functional movements. It is a series of constantly varied functional movements executed at high intensity. Rounds for time. Complete the prescribed reps and sets in as short a time as possible. AMRAP (As Many Rounds As Possible), An amount of time is set to complete as many rounds and reps as possible within the time limit. EMOM (Every Minute On the Minute). Complete a set amount of reps and sets at the start of every minute for a set amount of minutes. Metabolic conditioning has been extremely beneficial in my own performance enhancement. When I ran track and field and played soccer competitively, I trained in this manner. More recently I have utilized this form of exercise to prepare myself for competitions such as obstacle course races, 5K’s, and fitness competitions. I have specifically used Met-Con for Spartan Race training which requires me to perform a variety of tasks such as running, rope climbing, dragging/carrying odd objects, and even spear throwing! Metabolic conditioning has helped me achieve my goal of staying in excellent shape so I can continue doing the things I love. In my opinion, it can also help to reverse some of the effects of aging and injury. If you would like to experience how metabolic conditioning can apply to you, I currently teach a Saturday morning class called Met-Con. Feel free to reach out to me with any questions about this class, metabolic conditioning or personal training in general. I can be contacted at jjones@racmn.com. 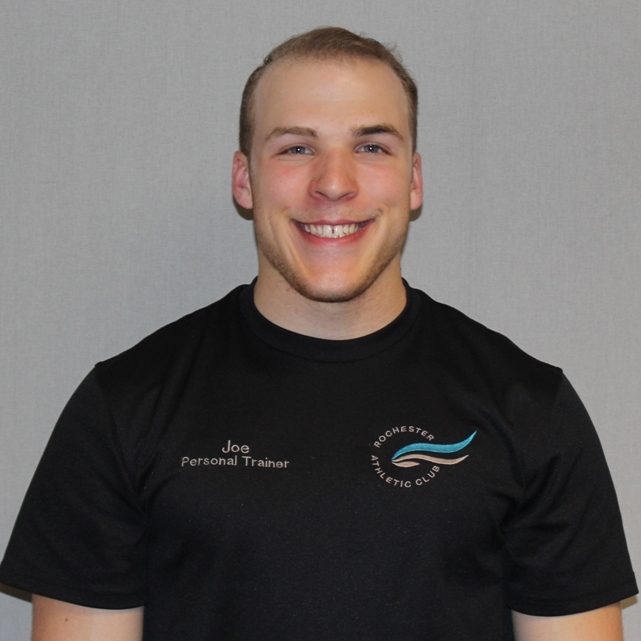 Joe is an ACE Certified Personal Trainer, as well as a CrossFit Level 1 Trainer. Joe trains for competitions that involve HIIT (High Intensity Interval Training), olympic weightlifting, and gymnastics as well as powerlifting. When he's not at work he's coaching high school track and field. Joe enjoys spending time with his family and friends.